Femur head showing a flap of cartilage (osteochondritis dissecans) due to avascular necrosis. Specimen from total hip replacement surgery. Avascular necrosis (AVN), also called osteonecrosis, bone infarction, aseptic necrosis, and ischemic bone necrosis, is cellular death (necrosis) of bone components due to interruption of the blood supply. Without blood, the bone tissue dies and the bone collapses. If avascular necrosis involves the bones of a joint, it often leads to destruction of the joint articular surfaces. (see Osteochondritis dissecans). While it can affect any bone, about half of cases show multiple sites of damage, avascular necrosis primarily affects the joints at the shoulder, knee, and hip. The classical sites are: head of femur, neck of talus and waist of scaphoid. In many cases there is pain and discomfort in joints which does not go away but rather increases over time. Clinical avascular necrosis most commonly affects the ends (epiphysis) of long bones such as the femur (the bone extending from the knee joint to the hip joint). Other common sites include the humerus (the bone of the upper arm), knees, shoulders, ankles and the jaw. The disease may affect just one bone, more than one bone at the same time, or more than one bone at different times. There are many theories about what causes avascular necrosis. Proposed risk factors include, chemotherapy, alcoholism, excessive steroid use, post trauma, caisson disease (decompression sickness), vascular compression, hypertension, vasculitis, arterial embolism and thrombosis, damage from radiation, bisphosphonates (particularly the mandible), sickle cell anaemia, and Gaucher's Disease. In some cases it is idiopathic (no cause is found). Lupus is also a common cause of AVN. Prolonged, repeated exposure to high pressures (as experienced by commercial and military divers) has been linked to AVN, though the relationship is not well-understood. The hematopoietic cells are most sensitive to anoxia and are the first to die after reduction or removal of the blood supply, usually within 12 hours. Experimental evidence suggests that bone cells (osteocytes, osteoclasts, osteoblasts etc.) die within 12–48 hours, and that bone marrow fat cells die within 5 days. Upon reperfusion, repair of ischemic bone occurs in 2 phases; First, there is angiogenesis and movement of undifferentiated mesenchymal cells from adjacent living bone tissue grow into the dead marrow spaces, as well as entry of macrophages that degrade dead cellular and fat debris. Second, there is cellular differentiation of mesenchymal cells into osteoblasts or fibroblasts. Under favorable conditions, the remaining inorganic mineral volume forms a framework for establishment of new, fully functional bone tissue. Orthopaedic doctors most often diagnose the disease except when it affects the jaws, when it is usually diagnosed and treated by dental and maxillofacial surgeons. In the early stages, bone scintigraphy and MRI are the preferred diagnostic tools. X-ray images of avascular necrosis in the early stages usually appear normal. In later stages it appears relatively more radio-opaque due to the nearby living bone becoming resorbed secondary to reactive hyperaemia. The necrotic bone itself does not show increased radiographic opacity, as dead bone cannot undergo bone resorption which is carried out by living osteoclasts. 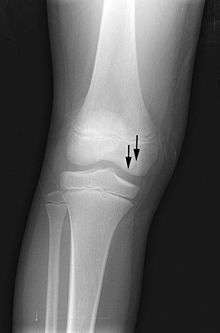 Late radiographic signs also include a radiolucency area following the collapse of subchondral bone (crescent sign) and ringed regions of radiodensity resulting from saponification and calcification of marrow fat following medullary infarcts. Radiography of total avascular necrosis of right humeral head. Woman of 81 years old with diabetes of long evolution. Radiography of avascular necrosis of left femoral head. Man of 45 years old with AIDS. Nuclear magnetic resonance of avascular necrosis of left femoral head. Man of 45 years old with AIDS. Avascular necrosis is especially common in the hip joint. A variety of methods are now used to treat avascular necrosis, the most common being the total hip replacement, or THR. However, THRs have a number of downsides including long recovery times and short life spans (of the hip joints). THRs are an effective means of treatment in the geriatric population; however, doctors shy away from using them in younger patients due to the reasons above. A new, more promising treatment is hip resurfacing or metal on metal (MOM) resurfacing. It is a form of a THR, however in this procedure, only the head of the femur is removed as opposed to a THR in which the entire neck is removed. MOM resurfacing is still experimental in America but has been endorsed in Great Britain as an excellent alternative to a THR. A MOM resurfacing may not be suitable in all cases of avascular necrosis; its suitability depends on how much damage has occurred to the femoral head. The bone is broken down by osteoclasts and rebuilt by osteoblasts. Some doctors also prescribe bisphosphonates (e.g. alendronate) which reduces the rate of bone breakdown by osteoclasts, thus preventing collapse (specifically of the hip) due to AVN.Other treatments include core decompression, where internal bone pressure is relieved by drilling a hole into the bone, and a living bone chip and an electrical device to stimulate new vascular growth are implanted; and the free vascular fibular graft (FVFG), in which a portion of the fibula, along with its blood supply, is removed and transplanted into the femoral head. Progression of the disease could possibly be halted by transplanting nucleated cells from bone marrow into avascular necrosis lesions after core decompression, although much further research is needed to establish this technique. The amount of disability that results from avascular necrosis depends on what part of the bone is affected, how large an area is involved, and how effectively the bone rebuilds itself. The process of bone rebuilding takes place after an injury as well as during normal growth. Normally, bone continuously breaks down and rebuilds—old bone is reabsorbed and replaced with new bone. The process keeps the skeleton strong and helps it to maintain a balance of minerals. In the course of avascular necrosis, however, the healing process is usually ineffective and the bone tissues break down faster than the body can repair them. If left untreated, the disease progresses, the bone collapses, and the joint surface breaks down, leading to pain and arthritis. Avascular necrosis usually affects people between 30 and 50 years of age; about 10,000 to 20,000 people develop avascular necrosis of the head of the femur in the US each year. When it occurs in children at the femoral head, it is known as Legg-Calvé-Perthes syndrome. 1 2 3 Digiovanni, Cw; Patel, A; Calfee, R; Nickisch, F (Apr 2007). "Osteonecrosis in the foot". The Journal of the American Academy of Orthopaedic Surgeons. 15 (4): 208–17. ISSN 1067-151X. PMID 17426292. 1 2 Chapman, C; Mattern, C; Levine, Wn (Nov 2004). "Arthroscopically assisted core decompression of the proximal humerus for avascular necrosis". Arthroscopy. 20 (9): 1003–1006. doi:10.1016/j.arthro.2004.07.003. ISSN 0749-8063. PMID 15525936. 1 2 Mansat, P; Huser, L; Mansat, M; Bellumore, Y; Rongières, M; Bonnevialle, P (Mar 2005). "Shoulder arthroplasty for atraumatic avascular necrosis of the humeral head: nineteen shoulders followed up for a mean of seven years". Journal of Shoulder and Elbow Surgery. 14 (2): 114–120. doi:10.1016/j.jse.2004.06.019. ISSN 1058-2746. PMID 15789002. ↑ Jacobs, Ma; Loeb, Pe; Hungerford, Ds (Aug 1989). "Core decompression of the distal femur for avascular necrosis of the knee". The Journal of bone and joint surgery. British volume. 71 (4): 583–7. ISSN 0301-620X. PMID 2768301. ↑ Bergman, Nr; Rand, Ja (Dec 1991). "Total knee arthroplasty in osteonecrosis" (Free full text). Clinical orthopaedics and related research (273): 77–82. doi:10.1097/00003086-199112000-00011. ISSN 0009-921X. PMID 1959290. ↑ Baykul, T; Aydin, Ma; Nasir, S (Nov 2004). "Avascular necrosis of the mandibular condyle causing fibrous ankylosis of the temporomandibular joint in sickle cell anemia". The Journal of craniofacial surgery. 15 (6): 1052–1056. doi:10.1097/00001665-200411000-00035. ISSN 1049-2275. PMID 15547404. 1 2 National Institute of Arthritis and Musculoskeletal and Skin Diseases (March 2006). "Osteonecrosis". Food and Drug Administration. Archived from the original on 23 May 2009. Retrieved 25 May 2009. ↑ Chao, Yc; Wang, Sj; Chu, Hc; Chang, Wk; Hsieh, Ty (Sep 2003). "Investigation of alcohol metabolizing enzyme genes in Chinese alcoholics with avascular necrosis of hip joint, pancreatitis and cirrhosis of the liver" (Free full text). Alcohol and alcoholism (Oxford, Oxfordshire). 38 (5): 431–436. doi:10.1093/alcalc/agg106. ISSN 0735-0414. PMID 12915519. ↑ Weinstein RS (2012). "Glucocorticoid-induced osteonecrosis". Endocrine. 41 (2): 183–90. doi:10.1007/s12020-011-9580-0. PMC 3712793 . PMID 22169965. ↑ Baksi, Dp (May 1983). "Treatment of post-traumatic avascular necrosis of the femoral head by multiple drilling and muscle-pedicle bone grafting. Preliminary report". The Journal of bone and joint surgery. British volume. 65 (3): 268–73. ISSN 0301-620X. PMID 6341373. ↑ Lee, Ck; Hansen, Hr (Sep 1981). "Post-traumatic avascular necrosis of the humeral head in displaced proximal humeral fractures". The Journal of trauma. 21 (9): 788–791. doi:10.1097/00005373-198109000-00006. ISSN 0022-5282. PMID 7277543. ↑ Zhang, Ld; Kang, Jf; Xue, Hl (Jul 1990). "Distribution of lesions in the head and neck of the humerus and the femur in dysbaric osteonecrosis" (Free full text). Undersea Biomedical Research. 17 (4): 353–8. ISSN 0093-5387. PMID 2396333. ↑ Lafforgue, P (Oct 2006). "Pathophysiology and natural history of avascular necrosis of bone". Joint, bone, spine : revue du rhumatisme. 73 (5): 500–507. doi:10.1016/j.jbspin.2006.01.025. ISSN 1297-319X. PMID 16931094. ↑ Laroche, M (May 2002). "Intraosseous circulation from physiology to disease". Joint, bone, spine : revue du rhumatisme. 69 (3): 262–269. doi:10.1016/S1297-319X(02)00391-3. ISSN 1297-319X. PMID 12102272. ↑ Dannemann, C; Grätz, Kw; Riener, Mo; Zwahlen, Ra (Apr 2007). "Jaw osteonecrosis related to bisphosphonate therapy: a severe secondary disorder". Bone. 40 (4): 828–834. doi:10.1016/j.bone.2006.11.023. ISSN 8756-3282. PMID 17236837. ↑ Martí-Carvajal A, Dunlop R, Agreda-Perez L (Oct 2004). Martí-Carvajal AJ, ed. "Treatment for avascular necrosis of bone in people with sickle cell disease". Cochrane Database of Systematic Reviews (4): CD004344. doi:10.1002/14651858.CD004344.pub2. PMID 15495103. ↑ Steinberg, Marvin E. (March 2008). "Osteonecrosis". Merck Manual of Diagnosis and Therapy. Archived from the original on 12 May 2009. Retrieved 25 May 2009. ↑ Maillefert, Jf; Toubeau, M; Piroth, C; Piroth, L; Brunotte, F; Tavernier, C (Jun 1997). "Bone scintigraphy equipped with a pinhole collimator for diagnosis of avascular necrosis of the femoral head". Clinical rheumatology. 16 (4): 372–377. doi:10.1007/BF02242454. ISSN 0770-3198. PMID 9259251. ↑ Bluemke, Da; Zerhouni, Ea (Aug 1996). "MRI of avascular necrosis of bone". Topics in magnetic resonance imaging : TMRI. 8 (4): 231–46. doi:10.1097/00002142-199608000-00003. ISSN 0899-3459. PMID 8870181. 1 2 3 4 Hall, [edited by] Brian K. (15 November 1989). Bone. CRC Press. pp. 74–. ISBN 978-0-936923-24-6. ↑ Agarwala, S; Jain, D; Joshi, Vr; Sule, A (Mar 2005). "Efficacy of alendronate, a bisphosphonate, in the treatment of AVN of the hip. A prospective open-label study" (Free full text). Rheumatology (Oxford, England). 44 (3): 352–359. doi:10.1093/rheumatology/keh481. ISSN 1462-0324. PMID 15572396. ↑ Judet, H; Gilbert, A (May 2001). "Long-term results of free vascularized fibular grafting for femoral head necrosis" (Free full text). Clinical orthopaedics and related research. 386 (386): 114–9. doi:10.1097/00003086-200105000-00015. ISSN 0009-921X. PMID 11347824. ↑ Gangji V, Hauzeur JP (March 2005). 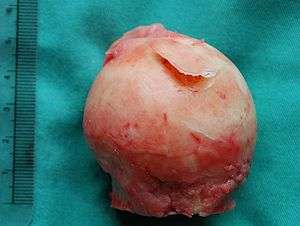 "Treatment of osteonecrosis of the femoral head with implantation of autologous bone-marrow cells. Surgical technique". J Bone Joint Surg Am. 87 Suppl 1 (Pt 1): 106–112. doi:10.2106/JBJS.D.02662. PMID 15743852. ↑ Lieberman, Jay R; Conduah, Augustine; et al. (December 2004). "Treatment of Osteonecrosis of the Femoral Head with Core Decompression and Human Bone Morphogenetic Protein". Clinical Orthopaedics and Related Research. 429: 139–145. doi:10.1097/01.blo.0000150312.53937.6f. PMID 15577478. ↑ Gross, Gw; Articolo, Ga; Bowen, Jr (1999). "Legg-Calve-Perthes Disease: Imaging Evaluation and Management". Seminars in musculoskeletal radiology. 3 (4): 379–390. doi:10.1055/s-2008-1080081. ISSN 1089-7860. PMID 11388931.